Elizabeth Levine Braun began her training in stained glass at L’Ecole des Beaux Arts, Aix en Provence, France in 1981. In 1984 Elizabeth traveled to North Carolina where she helped establish a large arts and crafts center and lead its stained glass department. In 1986 she founded Elizabeth’s Glassworks LLC, a custom art glass studio, originally in Old Town Alexandria, VA, now located in Slanesville, WV. Though self-taught in the art of glass fusing, beveling and sand blasting, Elizabeth began studying cast glass techniques in 1996 with many of the world’s leading glass artists – most recently with the incomparable Richard Whitely. 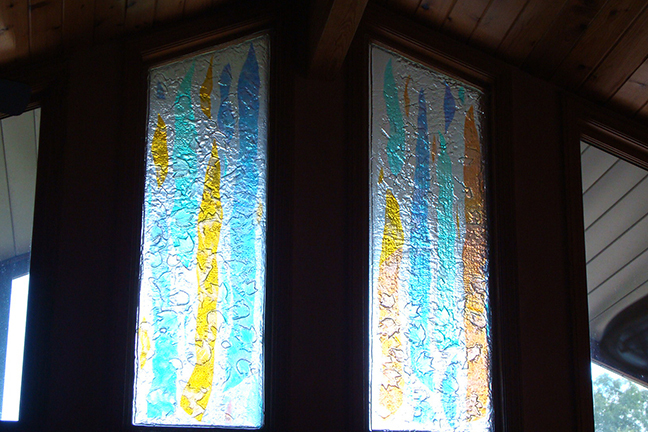 Other techniques Elizabeth utilizes include mosaic, torch working, glassblowing, glass casting and pate-de-verre. Elizabeth is an energetic instructor with an “anything is possible” approach. For over 30 years she has taught glass classes to students of all ages, conducting workshops and classes at Rockville Arts Place (now known as VisArts), adjunct faculty for the Corcoran School of Art, Maryland College of Art and Design, Glen Echo Park, Arrowmont School of Arts and Crafts, public and private schools and educational institutions, and regional artists collectives. Elizabeth was president of The National Capital Art Glass Guild for three years, and remains an active member of that organization. She is also a member of the Glass Art Society, the American Arts and Crafts Council, Allegheny Arts Council, and is on the board of directors for Hampshire County Arts Council. In 2008, Elizabeth bought a piece of paradise in West Virginia. Her studio is a big barn on the Little Cacapon river, where she finds much of her work reflecting the peace and beauty of the natural world around her. It’s very difficult to choose just a couple of images to represent my work. I like to work in many different ways with glass. 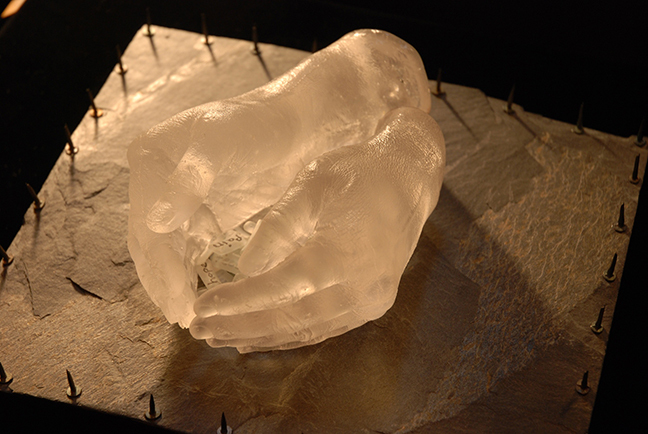 I am a commission artist creating one of a kind, out of the ordinary, architectural elements, like pizza oven facades or cast glass windows, but in my “free” time I like creating primarily lost wax sculptural pieces. Over the years, casting my hands has been a recurring theme. I started drawing, doing batiks, paintings, clay models of my hands when I was a little kid. I also started writing poetry when I was six, and majored in creative writing in college. I often incorporate words in my glass art. I consider my sculptural pieces to be visual poetry. I am keenly interested in emotions, the energy we all share, the power of words and images. In a recent two-woman show, I created a piece called “Best Wishes”, a six foot tall wall piece comprised of pockets of glass woven together with wire and fiber. I asked gallery patrons to write on slips of paper what their best wishes for others would be, and insert them in the pockets. It was extremely rewarding. I know what I think, but seeing other people’s wishes, and spreading them to others, is what makes the world go round in my opinion. I am now creating table top pieces for people to collect wishes in their homes. Now that I am working out in the country – out of my barn surrounded by mountains – my work is reflecting the beauty of nature around me, and I’ve started casting tree-like sculptures, and messages from the river.